The New York Times reported today that Color Genomics, a Silicon Valley startup has raised $115 million to make a $249 genetic test a reality. The test identifies faulty BRCA, as well as more than a dozen other cancer-related genes. BRCA1 and BRCA2 mutations are responsible for increasing women’s risks for developing certain breast and ovarian cancers. Filmmaker and actress Angelina Jolie has made headlines over the past few years for her decisions to undergo a preventive mastectomy, and more recently, a preventive oophorectomy in response to her own gene-related disease risks. The test works using a familiar model: the direct-to-consumer spit test pioneered by 23andMe nearly a decade ago. For $249 people can order a testing kit from Color’s website. After returning their samples, consumers get their results emailed to them, which they can take to their own doctors, or they can schedule an appointment with one of Color’s genetic counselors. Having watched 23andMe have the health screening part of its business scrubbed by the FDA, Color has been careful to cross and dot its regulatory “t’s” an “i’s”. Color’s diagnostic is a laboratory developed test (LDT) with an in-house lab and doctors involved. When individuals order their own tests, Color’s doctors analyze and interpret the results. Independent physicians can order tests for their own patients and evaluate the results themselves. This model means that Color can go forward without FDA approval for its test. Is Cheaper, Democratized Genetic Testing Necessarily Good for Everyone? 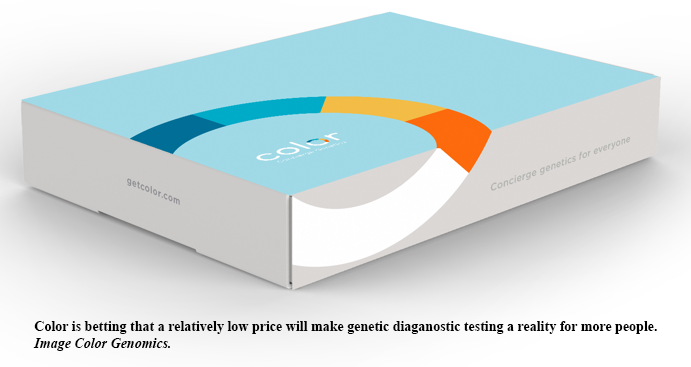 Color’s test costs a fraction of what the most widely available genetic tests do, and most of them are not covered by insurance companies. At $249, Color is betting that people will use their diagnostics because even if they have to pay for it out-of-pocket, the price won’t bankrupt them. On the other hand, some experts are concerned that we may be moving toward widely available genetic testing too quickly. On its website, Color acknowledges that everyone who tests positive for a mutation will not get cancer, and, conversely, everyone who tests negative isn’t guaranteed to be cancer-free for life. But now the floodgates are open, and Dr. Offit is probably right. However, as with the most disruptive innovations, we’ll catch up. 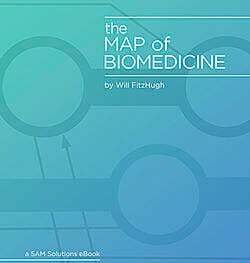 For nearly a year, 5AM’s Chief Science Officer, Will FitzHugh has been tracking changes and advancements in diagnostic testing on the Map of Biomedicine series on this blog. Stay tuned, because you’ll be able to download a free, updated and expanded version of those blog posts in ebook form soon. If you haven’t already, you can read Will’s latest MoB post, which marks the beginning of a new vignette. This time he’s covering the path that takes drugs from the lab to your medicine cabinet.